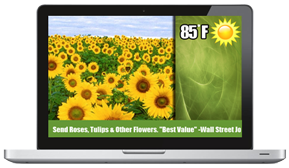 The SignagePlayer software is the work horse of our Digital Signage solution. It is a robust presentation player that was designed from the ground up to be efficient and secure. Built using an open source SDK, it supports the most widely used file formats including HD video, audio, animation and images. 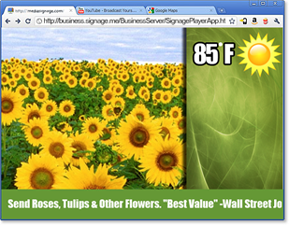 The SignagePlayer can run pretty much anywhere, on Windows, Mac, iOS, Android as well as inside web browsers. The SignagePlayer can operate for months without a single reboot, yes it is that efficient. Connect it to our DSXpressCLOUD or to your own private DSXpressSERVER, it’s up to you. It is controlled by the SignageStudio using real time socket connection. If you have a firewall installed on your network, the SignagePlayer still will find a way to connect by falling back onto HTTP polling. You don’t need any static IPs or any special configuration. The SignagePlayer is pure genius. Always up-to-date - It doesn’t matter where you are running your SignagePlayer, the software version is always the latest with over the air updates. This ensures that you can remotely manage all signage stations without having to physically attend to each one. Many Interfaces - Get touch screen interaction with the Kiosk builder. Let users guide their way through your menu system. Use the Kiosk builder to construct an Application using drag and drop tools. You can even build an interactive Way-finder or dynamic product selectors that can be tied to an external middle-ware database. The SignagePlayer is common UI App that goes anywhere you need it to be. The SignagePlayer Desktop version is a standalone application that can be installed on any Windows or Mac dedicated computer. The SignagePlayer Desktop version supports off-line playback; so incase of an internet outage your viewers will not experience any interruption in the playback. A single SignagePlayer Desktop will support as many screens as the total number of video outs from a single computer. The application was built using an open source framework and you can install it on as many computers as you want and control unlimited number of screens from the DSXpressCLOUD. 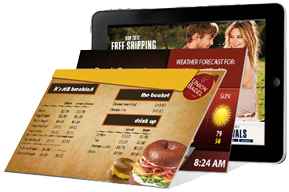 The SignagePlayer Mobile version was designed as a fully capable, light weight Digital Signage Player. It supports both phones and tablets including the Apple iPhone and iPad as well as Android phones and tablets. 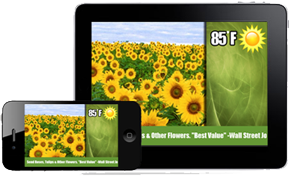 The SignagePlayer Mobile version is a 1st class application designed to operate with underpowered devices while delivering a rich experience to your viewers. The SignagePlayer Mobile also supports touch screen functionality, so you can use the Kiosk builder to create an interactive presentation and deliver it everywhere. The SignagePlayer Web version is a great way to share your presentation with others. Simply use the [Copy to clipboard] button directly from any campaign and paste the URL to an email. Now it’s easy to collaborate with friends and colleagues. Best of all, make a change once in the SignageStudio and it will automatically update everywhere. The SignagePlayer Web supports all popular desktop browsers including Internet explorer, Firefox, Chrome and Safari.